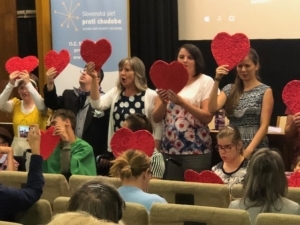 On our last day in Slovakia we were invited to the Slovak parliament to discuss with social commitee members, SAPN members and people experiencing poverty. Our host was Sona Gaborcakova, MP for the OLaNO party in opposition. She started by saying that she was very pleased with out visit, since the word ‘poverty’ in Slovakia is a taboo term. But with striking figures she showed that, although the country’s economy is doing relatively well and its ranking on the OECD scale is quite good, poverty does exist and is even increasing in the country because of the ever increasing cost of living. Slovakia can not even provide the existential minimum to people of 1 meal per day and a roof above one’s head. 66€ minimum income per person, without access to good quality services is pointless, she said. Families with children are particular at risk of not getting enough income support. 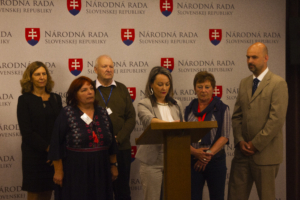 The chair of the social committee, Alena Basistova, from the ruling SMER party, was happy that the EMIN bus toured in Slovakia but she regretted that we didn’t stop in Kosice, to meet the large Roma community living in the area and discover the problems they face. She praised the new law on social services, that is making it possible to invest more in structural solutions to problems related to poverty. Funding that went to the region for occasional projects has been re-centralised to enable new investments in underfunded social services. Not sure if that was positive news, since we discovered later that the investments went to the classical institutions, that were judged inadequate by our contacts in civil society in previous days. 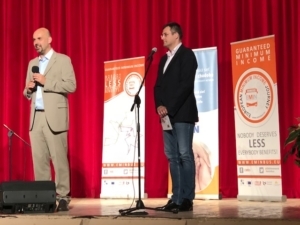 The deputy Minister for Labour, Branislav Ondrus, stated that Slovakia has to face 2 challenges with regard to the fight against poverty and social exclusion. First invest more in social services for vulnerable groups. He appealed upon the NGOs to support the mayors who invest in community services especially for Roma, because notwithstanding very positive results, public opinion is against using tax income for them. Second, he plead for more activation conditionality related to income support, by means of community work, (imposed!) voluntary work or responsible parenthood. Zuzana Kusà , researcher and former president of the Slovakian network agreed that it is important to combat negative stereotypes that exist in public opinion, but she strongly opposed conditioning support even more than now: it is a moral trap she said, to punish children by cutting income from their partens when their behaviour is seen as inappropriate, since that would be very detrimantal for their development. During the discussion, arguments came up to grant rentless loans to homeless people to build their own homes, instead of investing in refurbishment of big structures. The meeting ended with a short cultural programme by the children from the Saint Anna center from Stara Lubovna. 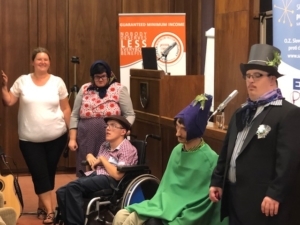 These children with disabilities, assisted by their parents, performed a traditional Slovak song and ceremony where the groom has to ask the parents for the hand of the bride. After a short audience in the Primacial Palace with the vice-mayor of Bratislava, Dr. Plsekova, who also recorded a video message for the EMIN project, we headed to the cultural center for a concert by a famous singer and actor Gizka Onova, who in her songs very often describes the difficulties of vulnerable people. After that an interfaith dialogue took place under the title ‘together for a dignified life for everybody. A Christian priest, a Muslim imam, a Jewish rabbi and a Buddhist lama discussed under the guidance of Mario Nicolini, director of the Forum of the World’s Religions. In the evening, we concluded our programme with a public event with music by the group Kalish. Quote of the days: “it is a moral trap to punish children by cutting income from their parents when their behavior is seen as inappropriate, since that would be very detrimental for their development” Zuzanna Kusà, researcher, SAPN.